Today, many of us do the bulk of our writing on our phones, while our PC usage is getting more and more restricted to work. You might sit down on your laptop to send an email to your boss, but you’re probably typing a lot more text through the day in the form of text messages, social media updates, and even less formal emails. And even though displays get bigger, typing on a touchscreen can often leave something to be desired. To speed up the process as much as possible, we all take shortcuts, so things like capitalisation and punctuation often take a back seat to sending a message quickly. Spellcheck can protect us not from misspelled words and messages like “c u 2nite”, but errors of capitalisation, article usage, prepositions and the rest are unfortunately way too common, and not caught by spellcheck. Enter Grammarly, which can look at complete sentences to analyse your usage, and suggest corrections where you might have made an error, and even offer improvements if it thinks you can rephrase something to make it sound better. The service has been available on the desktop as add-ons for various applications and even as browser extensions for a while now, and it launched as a free Android keyboard on Tuesday. To find out how useful the Grammarly keyboard is, I installed it on Android and took it for a spin – it’s also available for free on iOS if you’re an iPhone user. If, like me, you suffer from apostrophe blindness, where you will sprinkle those small signs about like salt on a meal – not because you don’t understand the difference between its and it’s, but purely out of absent-mindedness – then a tool that can keep an eye on these kinds of silly mistakes sounds like a nice thing to have in your belt. Details about corrections are available as cards. The way it works is pretty straightforward. 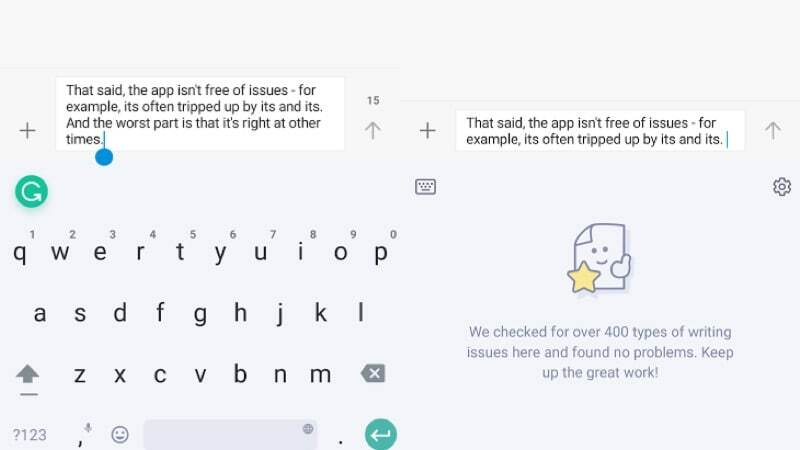 While typing, Grammarly processes the text and any error it notes is flagged with a numbered badge just above the keyboard – where other keyboards show the spellcheck suggestions. It automatically corrects misspelled words, and otherwise highlights suggestions such as an extra space in the text, or improper capitalisation. So for example, when I typed a few lines from notes for a story about blockchain, it corrected bitcoin to Bitcoin, and then taught me that I was using ‘with’ where I should be using ‘to’. 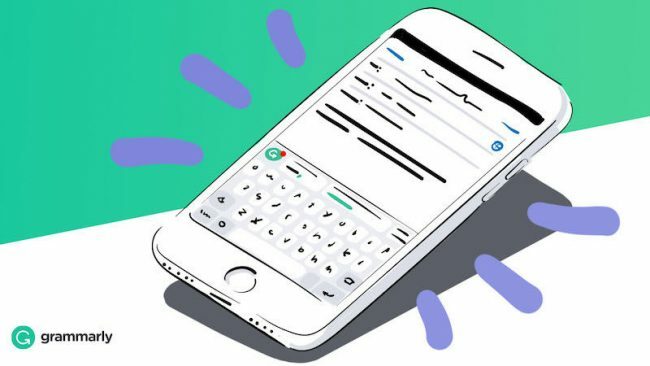 If you update a longer text – such as mail draft perhaps – Grammarly will check the full text and offer suggestions there, and the kinds of common mistakes I’ve seen people on social media make, like “now I said him” instead of ” then, I told him” are quickly spotted and corrected. In this way, even if you don’t have glaring issues in your writing, Grammarly can make a small impact and improve your output. Not bad for a free app, though there’s an (optional) premium membership that can let Grammarly apply different presets for when you’re writing a letter to your friends, or when you’re sending a business proposal. Premium members also get the Vocabulary Enhancement feature, where Grammarly suggests alternatives to words you repeat too often. It’s a feature that I could definitely make use of, so I’m tempted to get the full version, but Grammarly isn’t perfect. Although the app does a great job of picking up on a number of issues, from obvious ones like misspelled words to more complicated grammatical problems, it definitely has limitations. For example, its success rate with choosing the correct version of its and it’s is pretty good when you’re typing, but it’s not fool-proof. When I typed its and it’s in the previous sentence, Grammarly wanted to turn them into its and it’s respectively. Aside from this, it also had some inconsistent capitalisation on words like Bitcoin. The most common problem I faced, unfortunately, was Grammarly accepting my misused apostrophes. This might not be an issue for most people though, as not everyone shares my blind spot towards apostrophes. Grammarly isn’t 100 percent foolproof. Then there are its shortcomings as a keyboard. It lacks features like gesture typing (swipe typing), and the feedback when typing isn’t really great either. There’s not enough visual feedback when you hit the keys, and the overall typing experience felt unsatisfying, like using a physical keyboard where the keys are just rubbery and not at all springy. Individually, both these shortcomings would be acceptable, but combined together, it’s a real issue and made us want to switch back to Gboard as quickly as possible. Of course, Grammarly has just launched on Android, and is fairly new on iOS as well. Updates and developments will surely happen as we go along and it’s possible that the Grammarly keyboard could improve on these fronts. At that point, it’ll become a must-have on my phone, but for now, it’s definitely optional. Now if you’ll excuse me, I need to check all the apostrophes in this article before I hit publish. Do iPhones Really Hold Their Price Better Than Android Phones?